The Tokkōtai Commemoration Peace Memorial Association and the Association to Pass On the Japanese Spirit (Nihonjin no kokoro o tsutaeru kai) have worked together since 2006 to support erection of monuments to honor the young men who died while carrying out special (suicide) attacks during WWII. 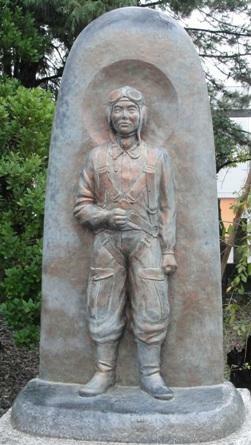 The monuments each have the same bronze figure of the front half of a kamikaze pilot standing on a stone pedestal. The large characters on the plaque on front of the pedestal say "Ā tokkō" (Ah, Special Attacks). This is also the title of a CD of songs related to special attacks. The Association to Pass On the Japanese Spirit coordinated the creation of this CD and released it for sale in early 2006. The profits from CD sales have been used to support erection of monuments to honor those members of the Special Attack Corps who died in battle. The plaque on front also has in small characters the following statement: "We certainly will never forget you." 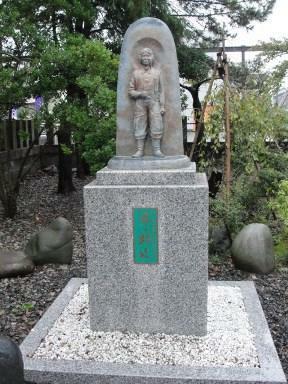 In 2007, replicas of the figure of a standing kamikaze pilot were erected at the following shrines throughout Japan: Fukui Gokoku Jinja, Kagoshima Gokoku Jinja, and Setagaya Kannon Temple in Tōkyō Prefecture. Others have been erected at Ehime Gokoku Jinja in 2008 and Ōsaka Gokoku Jinja in 2009, and the Tokkōtai Commemoration Peace Memorial Association and the Association to Pass On the Japanese Spirit continue to work to erect additional monuments. Prefectures in Japan generally have a prefectural gokoku jinja, which is a Shintō shrine dedicated to those persons from that prefecture who died to defend the country. Each gokoku jinja has a variety of monuments to remember those who died in wars. At the end of 1944 while the Greater East Asia War situation was worsening steadily, many young men volunteered for the Special Attack Corps in order to protect their country, parents, brothers and sisters, wives and girlfriends, and dear children. As they hoped that beautiful Japan would continue forever, they pledged to meet together under the cherry trees of Yasukuni Shrine. Over 60 brave men met their deaths in battle in southern skies and seas. We will never forget that today's peace and prosperity were built on the blood and tears of men in the Special Attack Corps, who fought giving their lives, and of their bereaved families. Here we erect a monument to the over 60 brave men from Fukui Prefecture in the Special Attack Corps. We praise their great accomplishments and distinguished service, and we pass on their spirit to posterity. Although the monument displays a kamikaze pilot, the phrase "southern skies and seas" means that the monument also honors those who died in special attacks carried out with weapons other than aircraft such as explosive motorboats and kaiten manned torpedoes.